Victor Chocquet, Paris; sale, Galerie Georges Petit, Paris, 1 July 1899, lot 7. Ambroise Vollard, Paris (acquired at the above sale). Jos Hessel, Paris (acquired from the above, 2 February 1900). Christian Tetzen-Lund, Copenhagen (by 1917). Alfred Cassirer, Berlin (by 1930). Oskar Federer, Moravská Ostrava and Montreal (by 1936). Mme Lilli Lippmann-Wulf, New York. M. Knoedler & Co., Inc., New York (1945). Thomas L. Daniels, St. Paul (March 1945). Mr. and Mrs. David Rockefeller, New York (1950-1957). Florence J. Gould, New York (acquired from the above, 1958); Estate sale, Sotheby's, New York, 24 April 1985, lot 34. Acquired at the above sale by family of the present owner. J. Meier-Graefe, Cézanne und sein Kreis, Munich, 1920, p. 123 (illustrated; titled La route tournante). G. Rivière, Le Maître, Paul Cézanne, Paris, 1923, p. 133 (illustrated; titled L'allée des marronniers du Jas de Bouffan). K. Scheffler, "Die Sammlung Alfred Cassirer" in Kunst und Künstler, vol. XXVIII, 1930, p. 447 (illustrated). C. Tetzen-Lund and O. Thomsen, Chr. Tetzen-Lunds samling af moderne fransk malerkunst, Copenhagen, 1934, no. 2 (illustrated, pl. 16; titled L'allée des marronniers du Jas de Bouffan and La route tournante and dated circa 1883). L. Venturi, Cézanne: Son art--son oeuvre, Paris, 1936, vol. I, p. 165, no. 464 (illustrated, vol. II, pl. 139; dated 1885-1887). F. Novotny, Cézanne und das Ende der wissenschaftlichen Perspektive, Vienna, 1938, p. 198, no. 41. C.F. Ramuz, Cézanne Formes, Lausanne, 1968, fig. 17. J. Rewald, "Chocquet and Cézanne in Gazette des Beaux-Arts, vol. 74, July-August 1969, p. 82, no. 7 (illustrated, p. 54, fig. 14; titled Le Jas de Bouffan). I. Dunlop and S. Orienti, The Complete Paintings of Cézanne, New York, 1972, p. 103, no. 361 (illustrated, p. 102; dated 1885-1887). A. Barskaya, Paul Cézanne, Leningrad, 1975, p. 171 (illustrated). M. Potter, ed., The David and Peggy Rockefeller Collection, New York, 1984, pp. 150-151, no. 47 (illustrated). J. Rewald, Studies in Impressionism, New York, 1985, p. 165, no. 7 (titled En sortant d'Auvers). The New Painting: Impressionism, 1874-1886, exh. cat., The Fine Arts Museums of San Francisco, 1986, p. 203. J. Rewald, The Paintings of Paul Cézanne: A Catalogue Raisonné, New York, 1996, vol. I, p. 183, no. 268 (illustrated, vol. II, p. 86). P. Conisbee and D. Coutagne, Cézanne in Provence, exh. cat., National Gallery of Art, Washington, D.C., 2006, p. 84. Paris, 6, rue le Peletier, Troisième Exposition des Impressionnistes, 1877, possibly no. 22, 23, 24 or 25 (titled Paysage. Etude d'après nature). (possibly) Stockholm, Nationalmuseum, Fransk konst, March-April 1917, p. 43, no. 8 (titled Paysage). Amsterdam, Stedelijk Museum, Honderd jaar Fransche kunst, July-September 1938, p. 38, no. 24a. New York, Paul Rosenberg & Co., Loan Exhibition of Paintings by Cézanne for the Benefit of Fighting France, November-December 1942, p. 23, no. 7 (illustrated, p. 47; dated 1885-1887). Minneapolis Institute of Arts, 1946. Tokyo, Musée National d'Art Occidental; Musée de la Ville de Kyoto and Fukuoka, Centre Culturel, Exposition Cézanne, March-August 1974, no. 11 (illustrated). The Jas de Bouffan, Cézanne's family home near Aix, occupies a central place in both his life and his art. The sprawling country estate, which Cézanne's father purchased in 1859, featured a large Italianate manor house, a sizable garden with an oblong reflecting pool and a formal avenue of stately chestnut trees, and a patchwork of tenant farms and vineyards, totaling thirty-seven acres. It was here that Cézanne undertook some of his very earliest artistic experiments, decorating the walls of the salon in 1860-1861 with a series of monumental panels, including a portrait of his father and four classicizing female figures representing the Seasons. He began to work outdoors at the Jas in the mid-1860s and continued to do so for more than two decades. "Appropriating this small domain, with its avenue, its pool, and its towering trees, treating the farm like a little Mediterranean village and the manor like a chteau, he perfected his art, putting into practice all he had learned in Paris," Denis Coutagne has written. "It was there that he meditated on the experiments conducted in L'Estaque and Gardanne, there that he received--both literally and figuratively--his father's legacy" (op. cit., 2006, p. 92). Marronniers et ferme du Jas de Bouffan was painted around 1876, during a difficult period in Cézanne's personal life. In January 1872, his mistress Hortense Fiquet--whose existence Cézanne kept a closely guarded secret from his authoritarian father--had given birth to the couple's son Paul. The same summer, the young family settled in Auvers-sur-Oise, where Cézanne worked from nature alongside his mentor Pissarro, adopting the light, varied palette and loose, broken touch of Impressionism. By 1874, however, Cézanne was eager to return to the Jas de Bouffan. "It would make me extremely happy to work in the Midi, where the scenery offers so many opportunities for my painting," he wrote to his parents (quoted in ibid., p. 84). For the next three years, Cézanne led a peripatetic life, shuttling back and forth between Paris, where he had installed Hortense and young Paul, and Aix, the only place that he truly loved. "In Paris he must have been consumed by the desire to get back to the Jas de Bouffan, which offered him so many subjects, as well as isolation, a world of peace and harmony," John Rewald has written. "But once there with his parents, he doubtlessly suffered as much on the account of the separation from his son as from his father's domineering character--not to speak of the necessity of hiding his liaison" (op. cit., 1996, p. 189). Cézanne's major figure paintings of the mid- to late 1870s--Une Moderne Olympia, L'éternel féminin, and La tentation de Saint Antoine, most notably--all bear the unmistakable imprint of the artist's personal ordeals. In the landscapes that he painted at the Jas de Bouffan, by contrast, he seems to have found a respite from his demons. "The artist was clearly struggling with himself, striving to master a new technique that would result in a calmer painting style," Coutagne has written. "He pursued this endeavor through the systematic portrayal of the Jas estate" (op. cit., 2006, p. 85). 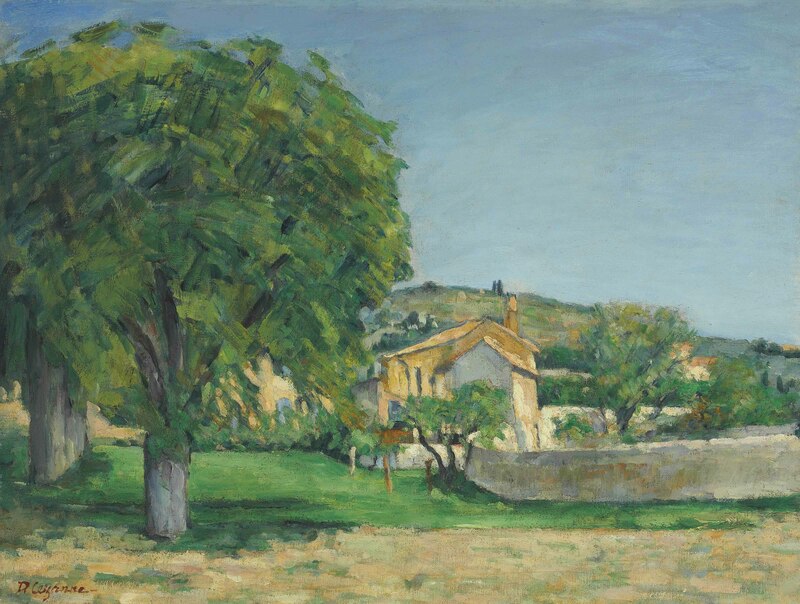 In the present landscape, we see some of the very earliest evidence of Cézanne's move away from a purely Impressionist technique toward a more systematic, structured approach to facture, especially in the small, square touches that describe the low wall at the right and the interlocking patches of parallel, diagonal strokes in the large chestnut tree. This evolving technique, Joseph Rishel has explained, "allowed Cézanne to render landscape with remarkable sensuality and specificity, but, unlike the ambitious plein-air paintings of his contemporaries, it transformed the transient into something classical, structured, and serene" (Cézanne, exh. cat., Philadelphia Museum of Art, 1995, p. 217). Marronniers et ferme du Jas de Bouffan depicts a corner of the family estate in full summer splendor, the trees in exuberant leaf and the high southern sky brilliant blue and cloudless. To paint the scene, Cézanne set up his easel at the very end of the allée of chestnut trees, looking toward a jostling complex of small, cubic farm buildings, which are silhouetted against the gently rolling hills in the distance. At the right of composition is the low stone wall that marked the eastern boundary of the estate's inner compound, setting it apart from the vineyards and fields beyond. The manor house itself lies to the left of the farm buildings, its cream-colored walls and blue shutters just barely visible through the dense foliage of the majestic tree in the foreground. Struck by the contrast between the strict geometry of the buildings and the lively tangle of vegetation which partially screens them, Cézanne returned to this view during the mid-1880s, painting at least five canvases from approximately the same vantage point (Rewald, nos. 538, 567, 595-596, 611; figs. 1-2; also Pushkin State Museum, Moscow, and Barnes Foundation, Philadelphia). Despite its apparent bucolic calm, however, the present landscape is not without signs of struggle. "The composition harbors intimations of anxiety and thwarted release," Rishel has written about a closely related scene. "Walls and paths strike strong directions only to have their trajectories countered by others--tree trunks or corners of buildings--intersecting at right angles, a compositional device that frustrates conventional perspectival resolution. Nothing is seen whole, especially the farm buildings, which in a less ambitious picture would have been the unambiguous subject. The overall shape of these structures must be pieced together from fragments" (ibid., p. 268). Equally striking is the way that Cézanne has hidden the main house of the Jas de Bouffan--no doubt a potent symbol for the artist, suffused with his father's presence--behind the trees, allowing the viewer only tantalizing glimpses of the structure. "It is as if the painter were simultaneously pointing to it and concealing it, deliberately obscuring what might be shown, as if to emphasize that it is through absence that we truly see," Coutagne has written (op. cit., 2006, p. 86). Indeed, it would not be until after his father's death in 1886 that Cézanne would finally depict the main faade of the manor house in all its sunlit glory, as though he were taking symbolic possession of the family home (Rewald, no. 600; fig. 3). "His work at the Jas would thus be like a biblical narrative, a tale about the acceptance of a paternal legacy, not as a prodigal son, but as the eldest son to whom the father had said: 'All that is mine is yours'" (ibid., p. 87). Along with its formal virtuosity and emotional resonance, Marronniers et ferme du Jas de Bouffan has an exceptionally important history. Its first owner was Victor Chocquet, an energetic champion of Impressionism and the earliest consistent buyer of Cézanne's work. A customs clerk of modest means, Chocquet nevertheless was able to amass a remarkable collection of paintings and drawings during the second half of the nineteenth century, including at least thirty-five works by Cézanne. Monet described Chocquet as the only individual that he had ever met "who truly loved painting with a passion," and Renoir called him "the greatest French collector since the kings, perhaps of the world since the Popes!" (quoted in J. Rewald, op. cit., 1996, p. 194). Cézanne made six oil portraits and numerous drawings of the dedicated and insightful Chocquet between their first meeting in 1875 and the collector's death in 1891; outside his circle of childhood companions and Impressionist colleagues, Chocquet was arguably Cézanne's closest friend (Rewald, nos. 292, 296-297, 460-461, 671; fig. 4). The present landscape is believed to be one of sixteen paintings that Cézanne contributed to the Third Impressionist Exhibition in 1877. The painting is signed in red, a feature that Rewald and Theodore Reff both associate with inclusion in this landmark exhibition. Chocquet always insisted that Cézanne sign the works that he purchased from him, and Rewald has proposed that the artist may have asked the collector for assistance in selecting the works to be shown--a corpus of considerable variety, which aptly summed up Cézanne's potent originality and growing importance as a painter of landscape, figures, and still-life alike. "The choice once made, Chocquet, according to habit, may have advised his friend to sign the canvases selected, and this was done then and there, the same red color being used throughout" (ibid., p. 178). Chocquet's fierce devotion to Cézanne and his colleagues did not stop there. Having resigned his customs post earlier in 1877, Chocquet was able to spend virtually all his time at the Impressionist Exhibition, challenging anyone who derided the work on view. The critic Georges Rivière later recalled, "He was something to see, standing up to hostile crowds at the exhibition during the first years of Impressionism. He accosted those who laughed, making them ashamed of their unkind comments, lashing them with ironic remarks. Hardly had he left one group before he would be found, farther along, leading a reluctant connoisseur, almost by force, up to canvases by Renoir, Monet, or Cézanne, doing his utmost to make the man share his admiration for these reviled artists" (quoted in A. Distel, Impressionism: The First Collectors, New York, 1990, p. 137). Chocquet died in 1891, just a year after he had commissioned Cézanne to paint a group of decorative panels for his new home on the Rue Monsigny in Paris (Rewald, nos. 643-644). When his wife passed away eight years later, Chocquet's collection was dispersed at public auction at the Galerie Georges Petit. The announcement of the sale generated a good deal of excitement. "Great artistic event in view," Pissarro wrote to his son. "Père Chocquet as well as his wife having died, his collection is going to be sold at auction. There are thirty-two first-rate Cézannes, which will sell for high prices" (quoted in ibid., p. 128). As Pissarro had predicted, the sale was an enormous success. Auction receipts totaled over 450,000 francs, with unprecedented prices achieved for Cézanne's work in particular. The present landscape sold for 1000 francs to Ambroise Vollard, who had given Cézanne his first one-man show four years earlier, catapulting him out of relative obscurity and securing his status as a modern master. Please note the correct dimensions are 19½ x 25 5/8 in. (49.5 x 65 cm. ).